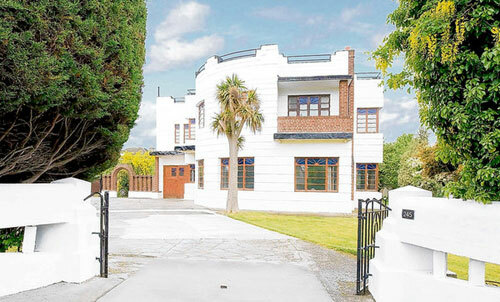 If you like the look of the old and the convenience of the new, this refurbished four-bedroom art deco property in Loughton, Essex could be ideal for you. Set in a cul-de-sac in what’s described as ‘a highly regarded part of Loughton’, the house has been subject of a total restoration project which combines period features of the era with many modern conveniences including a fabulous contemporary kitchen/breakfast room and a sophisticated integrated sound system. Set over two floors, the house, once the home of author Ruth Rendell, offers up four bedrooms, two bathrooms, a kitchen/breakfast room and a large and bright living room. Outside, there’s a garage and a fairly large garden with lawn to the rear. If that’s not enough space, there is planning consent for a two-storey extension to add a further bedroom suite. But as it stands, the house is o the market for £1,295,000. Now that is a house that I could picture furnishing in a lovely minimal modernist style, and being very happy in!